Hollis Gillespie is a mother, writer, friend, sister, girlfriend, daughter and more. 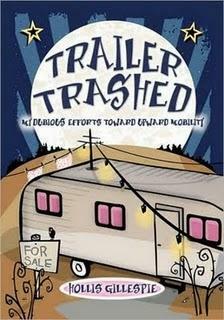 Her third book, Trailer Trashed, is comprised of touching and hilarious essays that shed light on all the different aspects of her life. Personal memoirs and essays are very much “in style” as far as writing styles go, but Gillespie’s book is the most up-front, unapologetic, laugh-out-loud, emotional one I’ve read recently. Gillespie's father sold trailers and drank heavily and her mother made missiles for the government. Her sister moved to South America and runs a bar. She collects trailers (yes, this inevitably stems back to her upbringing and her father’s job!) and worked as a flight attendant while being terrified of flying. The collection of people in her life is beautiful in it’s variety and eccentricity. Gillespie's writing seems to flow without fear and without rancor for situations that could cripple others: her father drank, she’s a single mother, her family moved a lot, she gave up drinking, etc. The collection is honest and forthright with messages of life and love woven throughout. The general message—though never written so banally as this—seems to be to carry on, persevere, and get things done no matter what obstacles or challenges you might face. Surround yourself with people you love and who love you. If you are in the Atlanta area, take advantage of the many classes and workshops that Hollis Gillespie offers. She teaches everything from new media and blogging to get your book published. The workshops run every couple of weeks. One of the little gems I gathered from simply looking around her website is that if you’re writing about yourself, particularly about trauma or stress you’ve gone through, make sure that you don’t write with pity or with bitterness. It’s a tidbit I’ve begun reminding myself of as I write.